Chris Garr joined Youth Challenge in 2008 as the Program Manager and is now the Chief Executive Officer. He is primarily responsible for collaborating with the Governing Board and Staff to advance the Mission and maintain the financial solvency of the organization by providing leadership, planning, and vision of programs, finance, resource development, donor relations, human resources, and communications. He is a Certified Disability Sport Specialist Level II and holds an Executive Certificate in Non-Profit Leadership and Management from the University of Notre Dame. Currently, Chris is Co-Chair of ADA Cleveland, an advocacy based collaboration of local non-profits serving people with disabilities. He was a member of the YC Summer Staff and a van driver from 1998-2001 and started his YC journey as a volunteer in 1991 at the age of 12. 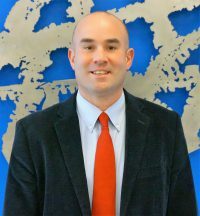 Prior to joining YC, Chris was the Social Studies Department Chair and a Social Studies and English Teacher at Northwest Catholic High School in West Hartford, Connecticut from 2001-2008. While there, he also served as the Intramural Sports Director, Yearbook Advisor and Girls Soccer Coach. Chris received a Masters of Arts in History from Trinity College in Hartford in 2007 and a Bachelors of Arts in History and African American Studies from Fordham University in 2001. While at Fordham, he was captain of the Cheerleading Team and was recognized for his contributions to the Athletic Department and Community Service program. He graduated from St. Ignatius High School in Cleveland in 1997. Chris resides in Berea with his wife Johanna, and two daughters, Emma and Victoria.